In the Middle Ages, the body of learning known as the liberal arts was grouped into two programs of study: the quadrivium, which covered mathematics, geometry, music, and astronomy, and the trivium, which covered grammar, logic, and rhetoric. Where numerical concepts were the basis of the quadrivium, the heart of the trivium was language, and as a foundation for thinking and the communication of thought, it was to be mastered first. It was part of a philosophy of education going all the way back to ancient Greece. 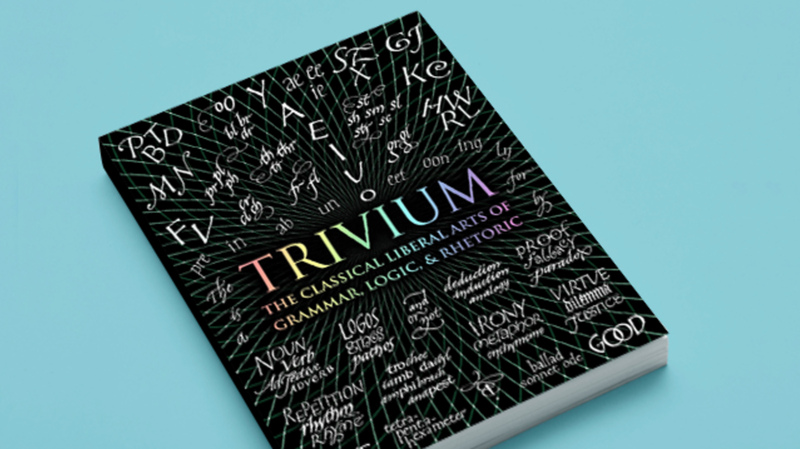 A new book from Bloomsbury’s Wooden Books series, Trivium: The Classical Liberal Arts of Grammar, Logic, and Rhetoric, brings together short, crisp introductions to the basic concepts in a classical course on language arts. It includes sections on euphonics, grammar, poetic meter and form, logic, rhetoric, and ethics. Learn about the five types of information that can be conveyed by a verb (person, tense, voice, aspect, mood), the four types of logical reasoning (deductive, inductive, abductive, analogical), the five elements of rhetorical persuasion (invention, arrangement, style, memory, delivery), Aristotle’s list of virtues (courage, temperance, generosity, magnanimity, gentleness, truthfulness, wit, friendliness), and the difference between a sonnet, a villanelle, and a sestina. The book is easy to dip in and out of and lays out the basics in a way that just might help us shore up our ability to think and communicate when we need it most.